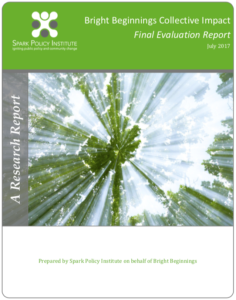 Bright Beginnings uses an approach called Collective Impact. In order to create lasting solutions to social problems on a large-scale, organizations — including those in government, civil society, and the business sector — need to coordinate their efforts and work together around a clearly defined goal. Collective Impact is the commitment of a group of actors from different sectors to a common agenda for solving a complex social problem. In Monterey County, we have a general commitment to work together in partnership, both in small and large-scale collaborative groups, on social issues. Shared Measurement: All participating organizations agree on how success will be measured and reported, with a short list of identified indicators used for learning and improvement.